The term pop-up book is often applied to any book with three-dimensional pages, although properly the umbrella term movable book covers pop-ups, transformations, tunnel books, volvelles, flaps, pull-tabs, pop-outs, pull-downs, and more, each of which performs in a different manner. Also included, because they employ the same techniques, are three-dimensional greeting cards. 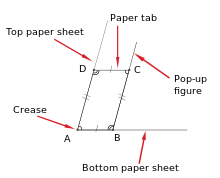 A geometric diagram of the basic principle of a pop-up book: the parallelogram. Design and creation of such books in arts is sometimes called "paper engineering". This usage should not be confused with traditional paper engineering, the engineering of systems to mass-produce paper products. The artistic aspect of paper engineering is related to origami in that the two arts both employ folded paper. However, origami in its simplest form doesn't use scissors or glue and tends to be made with very foldable paper; by contrast, pop-ups rely more on glue, cutting, and stiff card stock. What they have in common is folding. Animated books combine three elements: story, colored illustrations which include text, and "two or more animated illustrations with their movement mechanisms working between a doubled page.". In 1938, Julian Wehr's animations for children's books were patented as "moving illustrations" that move the picture up and down and horizontally at the same time with a single movement. Transformations show a scene made up of vertical slats. When a reader pulls a tab on the side, the slats slide under and over one another to "transform" into a totally different scene. Ernest Nister, one of the early English children's book authors, often produced books solely of transformations. Many of these have been reproduced by the Metropolitan Museum of Art. Volvelles are paper constructions with rotating parts. An early example is the Astronomicum Caesareum, by Petrus Apianus, which was made for the Holy Roman Emperor Charles in 1540. The book is full of nested circular pieces revolving on grommets. 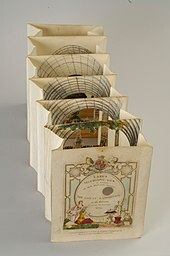 Tunnel books (also called peepshow books) consist of a set of pages bound with two folded concertina strips on each side and viewed through a hole in the cover. Openings in each page allow the viewer to see through the entire book to the back, and images on each page work together to create a dimensional scene inside. This type of book dates from the mid-18th century and was inspired by theatrical stage sets. Traditionally, these books were often created to commemorate special events or sold as souvenirs of tourist attractions. (The term "tunnel book" derives from the fact that many of these books were made to commemorate the building of the tunnel under the Thames River in London in the mid-19th century.) In the United States, tunnel books were made for such attractions as World's Fairs and the New York Botanical Gardens. Recently the tunnel book format has been resurrected by book artist Carol Barton and others as a sculptural book form. Artists are interested not only in the book's interior views, but also in treating the side accordions and covers as informational and visual surfaces A selection of tunnel books by Carol Barton is archived in the special collections of Virginia Commonwealth University's James Branch Cabell Library. The audience for early movable books were adults, not children. The first known movable in a book was created by Benedictine monk Matthew Paris in his Chronica Majora, which covers a period beginning in 1240. Paris attached volvelles onto some of the pages which were used by the monks to help calculate holy days. It is speculated that the Catalan mystic and poet Ramon Llull, of Majorca, also used volvelles to illustrate his theories in the early 14th century, but no physical example of a paper volvelle created by him has ever been documented. Throughout the centuries volvelles have been used for such diverse purposes as teaching anatomy, making astronomical predictions, creating secret code, and telling fortunes. By 1564 another movable astrological book titled Cosmographia Petri Apiani had been published. In the following years, the medical profession made use of this format, illustrating anatomical books with layers and flaps showing the human body. The English landscape designer Capability Brown made use of flaps to illustrate "before and after" views of his designs. While it can be documented that books with movable parts had been used for centuries, they were almost always used in scholarly works. In 1775 Thomas Malton published A Compleat Treatise on Perspective in Theory and Practice, on the Principles of Dr. Brook Taylor. A Compleat Treatise on Perspective is the earliest known commercially produced pop-up book since it contains three-dimensional paper mechanisms. The pop-ups are activated by pulling string and form geometric shapes used to aid the reader in understanding the concept of perspective. It was not until the very late 18th century that these techniques were applied to books designed for entertainment, particularly for children. Some of the first three-dimensional and tab activated books were produced by Ernest Nister and Lothar Meggendorfer. These books were popular in Germany and Britain during the 19th century. The great leap forward in the field of pop-up books came in 1929 with the publication of the Daily Express Children's Annual Number 1 "with pictures that spring up in model form". This was produced by Louis Giraud and Theodore Brown. Four more Daily Express Annuals followed and then Giraud setup his own publishing house, Strand Publications, this produced the groundbreaking series of Bookano books. The Bookano books are considered the first, true pop-up books for children because the pop-ups can be viewed from a full 360 degrees, not just the front side facing the viewer. There were seventeen Bookanos before the series came to an end with the death of Giraud in 1949. In the United States, in the 1930s, Harold Lentz followed Giraud's lead with the production of the Blue Ribbon books in New York. He was the first publisher to use the term "pop-up" to describe their movable illustrations. The next advance in the field was made by the astoundingly prolific Vojtěch Kubašta working in Prague in the 1960s. His lead was followed by Waldo Hunt in the US with his founding of Graphics International. He and two companies he established, Graphics International and Intervisual Books, produced hundreds of pop-up books for children between the 1960s and 1990s. Although intended for US audiences, these books were assembled in areas with lower labor costs: initially in Japan and later in Singapore and Latin American countries such as Colombia and Mexico. Hunt's first pop-up book was Bennett Cerf's Pop-Up Riddle Book, published by Random House as a promotion for Maxwell House Coffee and showcasing the work of humorist Bennett Cerf, who was then president of Random House. The team of Waldo Hunt and Christopher Cerf created a total of 30 more children's pop-up books for publication by Random House, including books that featured Sesame Street characters. According to Bennett Cerf (in his book At Random), pop-up books were profitable for Random House. In addition to his collaborations with Christopher Cerf at Random House, Hunt produced pop-up books for Walt Disney, a series of pop-up books based on Babar, and titles such as Haunted House by Jan Pienkowski and The Human Body by David Pelham. An exhibition of pop-up books curated by Carol Barton was shown at the Smithsonian Institution's Cooper-Hewitt Museum in New York. Her pop-up books, movable books, and tunnel books are in the collections of The Getty Museum, Victoria and Albert Museum in London, The Smithsonian Institution, and the Museum of Modern Art. Some pop-up books receive attention as literary works for the degree of artistry or sophistication which they entail. One example is Star Wars: A Pop-Up Guide to the Galaxy, by Matthew Reinhart. This book received literary attention for its elaborate pop-ups, and the skill of its imagery, with The New York Times saying that "calling this sophisticated piece of engineering a 'pop-up book' is like calling the Great Wall of China a partition". The 1967 Random House publication Andy Warhol's Index, was produced by Andy Warhol, Chris Cerf and Alan Rinzler, and included photos of celebrities together with pop-up versions of Warholesque images such as a cardboard can of tomato paste, as well as a plastic tear-out recording, an inflatable silver balloon, and other novelties. Pop-up book artist Colette Fu designed China's largest pop-up book. In 2008, she was awarded a Fulbright Fellowship to create pop-up books of the 25 ethnic minorities residing in Yunnan Province, China. Her work can be found in the Library of Congress, Metropolitan Museum of Art and National Museum of Women in the Arts. Since 1993, the Movable Book Society has provided a forum for artists, book sellers, book producers, collectors, curators, and others to share enthusiasm and exchange information about pop-up and movable books. The organization also awards industry prizes for best paper engineer (trade and artists’ book) and excellence in paper engineering by an undergraduate or graduate student. ^ Wehr, Paul (September 17, 2008). "Moving Illustrations: The Paper Engineering of Julian Wehr" (PDF). p. 2. Archived from the original (PDF) on 1 May 2016. Retrieved 12 December 2016. ^ "A Guide to the Papers of Julian Wehr, 1885-2004, n.d. (bulk 1943-1949)Wehr, Julian, Papers12250". ead.lib.virginia.edu. Retrieved 12 December 2016. ^ Wehr, Julian (1945). "Animated illustration". Retrieved 12 December 2016. ^ Wehr, Julian (1940). "Moving illustration". Retrieved 12 December 2016. ^ Allie Townsend, Pop-Up Book, in "All-TIME 100 Greatest Toys," Time, February 16, 2011. ^ a b c d e f Steven Miller, Waldo Hunt, 1920-2009; The 'King of the Pop-Ups' Made Books Spring to Life, The Wall Street Journal, November 24, 2009. ^ Ann Montanaro, "A Concise History of Pop-up and Movable Books", The Pop-up World of Ann Montanaro (exhibition), Rutgers University Libraries. ^ a b c Valerie J. Nelson, "Waldo Hunt dies at 88; entrepreneur revived the pop-up book as art form", Los Angeles Times, November 22, 2009. ^ Olmert, Michael (1992). The Smithsonian book of books (1. ed.). Washington, D.C.: Smithsonian Books. p. 233. ISBN 0-89599-030-X. ^ "A Galaxy in Your Face", The New York Times Book Review, November 11, 2007, children's book section. ^ Stinson, Liz. "A Mind-Blowing Pop-Up Book Shows China's Vanishing Tribes". WIRED. Retrieved 2017-08-17. ^ "The Movable Book Society". www.movablebooksociety.org. Retrieved 24 September 2016. Hinshaw, Craig (November 1999). "Looking into Tunnel Books". Arts & Activities. 126 (3): 34–35. Reynolds, Janet M. (2013). Exploring Artistic Learning Through the Creation of Tunnel Books. Boston University College of Fine Arts.